Starting a new business is always a risky venture. Even a home business startup, though it has lower overheads, can't be guaranteed to turn a profit in a hurry. Often, even with good sales, a small business won't make a profit at all during the first two years. This isn't such a bad thing. Low profits means low business taxes; and not making a profit doesn't mean you can't make an income. Just how business takings are distributed between expenses, profits and earnings is often confusing for the new entrepreneur. The first thing you need to understand is that your personal income isn't the same as your business' income, even if you're the only person working for the business. After all, the business has expenses which are not the same as your personal expenses. Your income is one of the things which the business has to pay for in order to function, so your income counts as a business expense. Of course, when a business is new, it can take some time for sales to get going, so takings are often low. For this reason, many small business owners opt not to take a salary for the first few years of their business' life. This means that all the business' income can be invested in making it grow faster and making it more successful in he long term. However, unless you're able to hold down another job at the same time, this is a strategy which you may not be able to afford. If you're starting out in business in order to escape unemployment, you'll find it difficult to get state support as your business grows. For this reason you'll need to think very carefully about your probably takings and possible earnings before you go into business at all. Working out your probable business income is an important part of constructing your initial business plan. There are two parts to this. 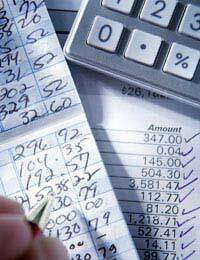 The first is to draw up a table of your projected earnings, month by month, for the first year of business operation. The second is to draw up a profit and loss account. In the first stage you should think carefully about your production capacity, the level of customer interest and any other factors likely to affect your sales. It's important to be realistic. If you find this difficult, look at similar small businesses and consider how things have worked out for them. When you draw up your profit and loss account you should look at your projected earnings alongside your expenses, including any debts you want to pay off and any interest on those debts. It's useful to do this initially without considering your own salary, as you can then use the resulting figure to help you decide how much of a salary you can afford to draw. When you are running your own business, you are not obliged to pay yourself minimum wage (though you are obliged to pay that to any employees who are not directors or partners). This means that you will sometimes be able to take enough to get by on without taking the kind of salary you would expect if you were doing the same job for an established company. Be realistic about your needs, however. If you find that you are unable to afford to work for your new business, closing it down will almost certainly mean losing a lot of money. It's important to realise that, in business, there is nothing inherently wrong with making a loss. You can pay yourself a salary, pay off your debts and pay for equipment and repairs without any of that money counting as profit. This means that it can sometimes be a good idea to raise your own salary, or to invest in new materials for the business, as the tax year draws to a close, in order to keep that money from being lost in taxes. The most important way to protect your earnings in business is to remain aware of the long term situation. As long as you and your business can get by, don't worry of you're not getting rich right away. It takes time to build brand awareness, establish good retail relationships and really carve out a space for yourself in the market. Be patient, work hard, and time will see you rewarded.